The beginnings of my Board. I’m still filling in the holes. As you can see, it has four lines: Act I, Act II part one, Act II part two, and Act III. This is based on Blake Snyder’s Save The Cat method, which some people say is really a four-act structure. Whatever you call it, the point is the lines should have an even amount of scenes in them. Each sticky note or index card represents a scene. More on what a scene is in the next post; for now, we’re just going to get “stuff that happens” up on The Board. If you did Outlining Method #1 or Outlining Method #2, you will already have stuff to put up on the board. These are likely not proper scenes yet, but that’s okay. For instance, if we use the Hunger Games Basic Beats as an example, the Catalyst is: “At the reaping, Katniss’s sister Prim’s name is picked.” Write that on a note/card and stick it on the Board. It’s not a full scene, but for now just get the main story points up there. Also put any ideas you have about the story on The Board. If you know at some point that your protagonist needs to discover their best friend is a liar, write “Hero discovers BFF is a liar” on a note/card and put it roughly where you think that needs to happen. Once you have all your story beats and ideas on The Board, start thinking in scenes. For example, where/when/how does your protagonist discover her BFF is a liar? Flush out the details a bit, but keep each scene on one note/card. When you’re done, you should have around 40 cards (i.e 40 scenes), 10 in each row, give or take a card. In a screenplay, this structure is pretty strictly followed given that films need to be a certain length, but there’s more room to play in a novel. Still, you want to keep each line roughly the same length. I’ll explain why below. The Board is a visual person’s dream and an excellent tool for any writer. It makes it easier to see the whole story (especially if you color code your plots), and in turn reveals problems you may need to fix. 1) Holes – Are you missing stuff? Do you have two side-by-side scenes that don’t connect? For example, does your character abruptly go from being in love to breaking up with her boyfriend? You have a story hole! You’re missing the scene that shows your character falling out of love. 2) Long Sections – Is your first line way longer than your other lines? This is quite common and is a sign that you have way too many scenes in the Set Up. Spend too much time setting up (Act I) and your readers will get impatient to start the journey (Act II). 3) Short Sections – This is most commonly seen in the fourth line (Act III), where a writer wraps up the story too quickly without addressing all the things that were set up in Act I. 4) Forgotten B Plots – Did you totally forget about your B Plot for ten scenes? This is easy to see if you color code your plots. Rearrange your notes/cards so your plots are more evenly spaced. 5) Weak Turning Points – In The Board, the end of each line* is a Turning Point (i.e. a plot point that spins the story in a new direction). So make sure that these scenes are pivotal. In TV they’re often called the cliffhangers before the commercials. End of line 1: Break Into 2 scene – this is the moment the hero decides to go on the journey. Make it a big deal! End of line 2: MidPoint – this is the scene where the hero thinks he’s achieved his goal but hasn’t, and stakes are raised. Make the stakes huge! End of line 3: Break Into 3 – this is the scene where the hero figures out what he needs to do to win and heads into the final battle. So that’s the benefit of The Board – you can see these story problems more easily than scrolling through a linear document on your computer. For visual people, this way of outlining is super helpful. 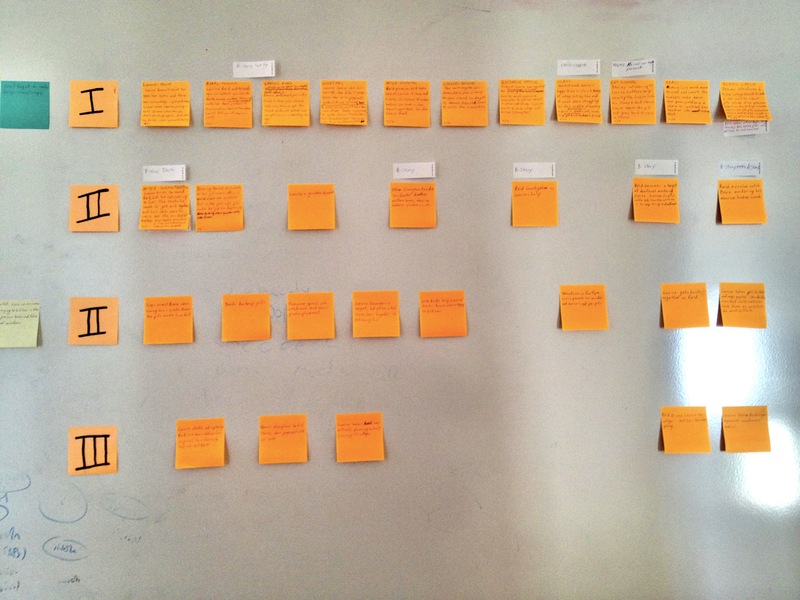 Next Up from Heather… How To Turn Sticky Notes into Proper Scenes. my fave method. How you use it can vary but it really is great for testing out stories. It is! Though recently my physical cork board has been neglected as I use Scrivener and spreadsheets to track my scenes. I love the method (I often use index cards and painters tape), but find my acts are often not even (i.e., contain different numbers of beats) and there are sometimes five acts, not four.